I have had a terrible time getting back into the swing of things here in NJ – I wake up in the morning thinking (hoping…) I’m still in Donegal. The price of an extraordinary Holiday! I’m enjoying going thru my photos – even the outtakes! – and will put together a succinct collection to share soon. Fortunately, we just dodged a hurricane here on the East Coast. Just a nor’easter… The weather in Ramelton continues to be way better than here! It was one of the best holidays I have ever had. 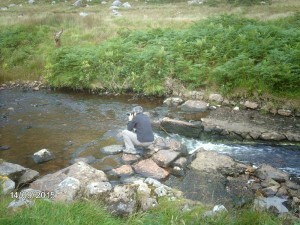 I took part in a walking and talking tour in County Donegal from 09.07. – 16.07.2011. It was a kind of a magic tour for me. A wonderful group with very nice people, magnificient landscapes, natural coastlines, wild countrysides, fantastic meals, long evenings and a lot of stories from Sean. I can really say “Walking and talking in Ireland with Sean is good for heart, body and soul” – and it is like a cure for everyone – Absolutely!!! It’s difficult to pick out one thing as being special as it was all so good. We’ve stayed in B and B’s all over the British Isles, but Ann’s is the best ever. Perhaps it was the gin and tonics that tipped the balance. The restaurants were excellent too. The walking was wonderful. It was so varied. I think we all enjoyed the Giant’s Causeway day and the last day the best. And as for the weather, I have to say that I got wetter walking home from the Underground Station than I did the whole week. Nina was great. She made us laugh a lot, as well as having read every book and every film that anybody mentioned. Many elements melded to make this an exceptional and unforgettable week. It was an unusually small group, with only three of us plus Sean. We hit it off beautifully and quite quickly felt as if we had known each other for a long time. That may have been serendipitous chemistry or perhaps it was Sean’s special gift for making people feel completely at ease. The weather gods were also on our side. Despite Ireland’s well-deserved fame for providing more than its share of “liquid sunshine,” we had only a few hours of a medium drizzle all week—most of which was spent walking through a beautiful sheltered forest on the Ards peninsula. The rest of the week was a brilliant mix of scenery. Our first day was on Rathlin Island, the northernmost point of Northern Ireland and a short ferry ride from the mainland. It’s a birder’s paradise—with puffins, guillemots, razorbills, and kittiwakes, among other species. Fantastic density of bird life! The next day we went to the Giant’s Causeway, an astonishing sight made even more dramatic by the long coastal pathways we took to reach it. A complete change of scene (and mood) came with our visit to the walled city of Derry, a place whose turbulent history Sean knows so well. Yet another change of scene came with our walk around Glenveagh Castle, straight out of a fairy tale with its exotic gardens (but somewhat menacing history). 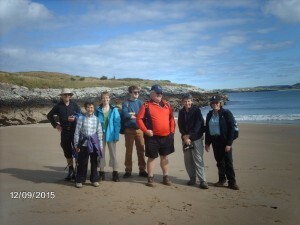 Our final day was on the Fanad Peninsula, a place of magnificent beaches. While each cove has its own singular character, the entire coastline has a completely otherworldly feel to it. Our week in Ireland went so quickly – it was a wonderful experience in every way – meeting you and Nina, the lovely walks, the talks, learning from you all about the area and its geography, history and geology, the good and delicious food, the Guinness (es), in fact everything conspired to make my visit really interesting and memorable. I also feel a bit fitter as a result of the exercise, but certainly no slimmer! I would like to thank you for a wonderful holiday. As a first introduction to Ireland it couldn’t have been better. The countryside, mountains and beaches have an unspoilt beauty which I haven’t found elsewhere. The warm welcome from the Irish community was refreshing it’s very unusual for people in Southern England to greet you with a smile and a hello. You managed the group with good humour , congratulations. I really look forward to seeing the photos, once again many thanks for an amazing holiday. were surrounded by friendly, sporty people from foot to head. or went under trees and saw mills. Irland brought to us it`s nature wealth. we were sitting together in happy mood. it was made for an experienced man, who has a friendly behaviour nice and warm. in our hearts pleasure lies. THANK YOU SEAN FOR ALL ! Hope to see you and the friendly members of our group again. I loved getting to know the various members of our group. I loved the balance between stop and go; between walking and talking. I loved Sean’s manner which is informal and low key. I loved our two B & B’s and all the delicious meals we had together. I loved the balance between comfort and work (i.e. walking). I was stunned, day after day, by the meadows, the cliffs, the rocks, and the tapestry of all the wild flowers, heather and ferns. Every trip involves two things: wrestling with logistics and immersing one’s self in a new world. Sean takes care of the logistics so well that we were free to lose ourselves in beautiful, tragic, and still beautiful Ireland. Since 2005, I’ve been on several Walking & Talking tours with Sean Mullan, both full week walks and weekend walks. Just the fact that I keep coming back to Donegal again & again should say something. From the warm welcome by Anne and Bert at Ardeen House, through the great walks in the most stunning landscapes, to the good ‘craic’ at the Bridge Bar at night: I can’t recommend a Walking & Talking tour enough! 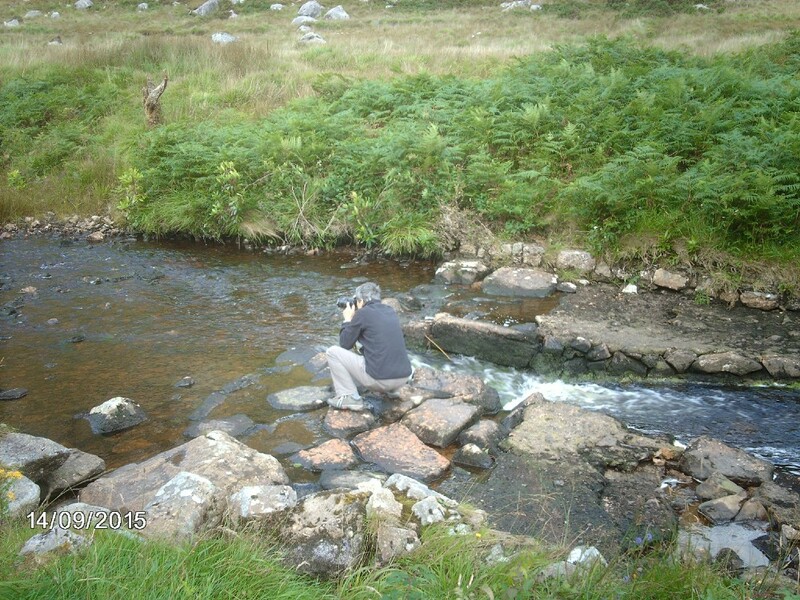 Ireland is a wonderful country and Sean showed us on our walking in Donegal some especially scenic places. Without Seans knowledge of this beauty routes, our trip would have been to typical tourist places.There were so many impressions I will keep in my mind. The day in Derry was full of the younger history of Ireland and the details Sean told helped to understand the background of this bloody period. It was the first time that we spend our holidays with a group of people we did not know before. But from the first day on it was a team. During our walks and in the bus everybody was talking to everybody and from my side all conversations were very pleasant and interesting. It was amazing! Thank you for a wonderful week. Merci pour cette semaine internationale, amicable, chaleureuse et revigorante qui m’a permis to pratiquer l’anglais. C’etait exactement ce que j’attendais de l’Irlande et des Irlandais… Sauf les courbatures! We got an idea of Mullan’s Medical Walking Treatment (MMWT) while having our banana-stops beside the daily ‘Kirsch’ – sip. MMWT became famous for providing people ( especially middle-aged women) with liquid sunshine for the skin, daily liquid Guinness for the soul and the Irish Times for the brain. Everything was so great ; the Irish people with whom we stayed, the walking and the scenery (fabulous), fellow hikers, and not to forget the succulent foods we ate! You were all so friendly, helpful , knowledgeable and considerate and things were well organised ; all contributed to make this a wonderful, positive experience. The fact that it was also a great stress buster was a bonus! Keep walking and talking in Ireland Sean! Sean Mullan has been walking the walk and talking the talk for about five years, and it showed. Tours turn into experiences when you’re accompanied by someone who has a passion for the place you’re visiting. There are new lessons learned when your guide can answer every question without consulting any prepared speeches. Sean opened my eyes to this country I knew nothing about. Our guide Sean Mullan, with the Irish gift for conversation, helps us absorb history and culture without ever sounding like a guide with a script. We loved our trip and our fellow walkers – thank you again for making it so wonderful. I am sure that you will see us in future. It was such a great tour!!! Thank you for everything. Hope you are fine. Everything was handled very warm and professional and that isn’t an easy balance. take care and have a beautiful day. Our expectations were more than fulfilled during a wonderful week in late August. The views we saw and the circumstances under which we did so were for us ‘out of this world’. This experience will for us always be deemed as unforgettable. The hospitality of the Irish people is amazing. The landladies were so very friendly and helpful, serving tea in the afternoon when we were tired after the walks. Then there was the wonderful spirit of the group, the various nationalities which meant interesting talks and experiences. And last but not least your very warm attitude to all of us, caring so well for everything. Having everything arranged and even with the possibility for individual arrangement was perfect. Meeting interesting people in a very relaxed atmosphere, spending the day and talking with them was very fine. Having a very competent local ‘guide’ through it all was indeed most exclusive. Hej!!! (=Swedish for hello) Thank you everybody for the best vacation ever! I had a great time! Coming back to Sweden was a little boring. I miss you all. The week was a magical and mystical experience for us – so full of history, geography, cultural insights, music, literature and a physical identification with the land through the walks. The Emerald Isle lives on in our hearts and minds. And we loved getting to know you all and we miss you. Our return to Sweden was easy, no delays. Now back in Sweden I think with pleasure of you all and the great week we spent together. I couldn’t have had better travelling companions. Sean, you are a superb tour leader.